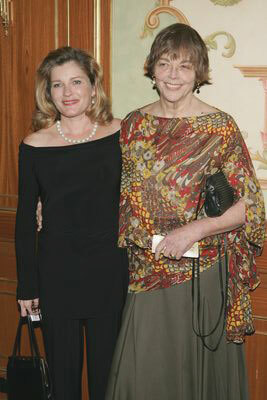 On Tuesday, January 10, 2006, I had the wonderful opportunity to interview Claire Labine for the Totally Kate website. Claire was co-creator, producer, writer of the daytime serial, Ryan's Hope, in which Kate played the role of Mary Ryan. I would like to thank Claire Labine for taking the time to speak with me and Kate Mulgrew for putting everything in motion. Many thanks to my transcriber! Interview copyright Totally Kate. Please do not repost or reproduce any part of this transcript. Totally Kate: I really want to thank you for taking the time to speak with me. Claire Labine: You're more than welcome. I would love it if we could… actually I'll be happy to continue in the morning but if we could be through by 6:30 it would really be helpful! Totally Kate: Oh that should be fine! Totally Kate: And I just loved it and I've watched the early years now twice on SoapNet. Claire Labine: Really? Have you? Oh that's wonderful. Of course that was Katie and… you know… it really was the best of the show. Claire Labine: Although we got off onto some… we got off onto some kind of wonderful tangents, but they threw us such a curve by telling us in the beginning that – right after we went on the air, in fact – the whole thing had been predicated on Frank Ryan's death, and Kate/Mary finding out what happens and why. And then they said, "No, no, no, everybody likes Frank too much, he's too central, he's got to live." And we said, "What? There goes two years of stories." And they said, "No, no, no. No problem." Easy for them to say! Totally Kate: Right, they just threw you a curve there! Claire Labine: They sure did! But Katie was, you know, really essential to the show's success. Just such a joy to work with and to write for. And one of the great treats of the business. Totally Kate: Right. Well, of course Mary was my favorite character. Totally Kate: And I was wondering - did you try out a lot of actresses for the part? And did you know right away that Kate was it? Claire Labine: …In a crisis. Totally Kate: Well, I think she was just perfect. Totally Kate: Now as the show went along, did you start to write Mary with Kate in mind? Claire Labine: We started writing Mary with Kate in mind at the moment after we saw Kate. But she was so what we had in mind for Mary. It was one of those… it was one of those times when the actress's appearance on the scene is just so dead right that you… you know, you can't believe your luck. We used to look at each other and say "Oh, my God! She is Mary Ryan." Claire Labine: Well she wasn't far from Mary Ryan, I mean really and truly in terms of her experience and her understanding of what was going on. Claire Labine: You weren’t suppose to. Totally Kate: …but I think I did because… well, because Mary liked him so much. Claire Labine: We had planned… I mean actually we had planned that story, but he was supposed to be abrasive. We were supposed to not like him. And we were supposed to see how thorny he was, and why he was as thorny as he was. And you… it was supposed to be a gradual process and I think that worked. I mean, I thought Michael did it brilliantly. And … because, you know, actors … actors want to be loved. Claire Labine: He was really skeptical about Frank, and he played the hell out of it. And it gave her something to play off of. Totally Kate: They were just great together. Claire Labine: They really were. And by the end, it was just… I thought it was just magic. I mean they broke my heart. Totally Kate: Well, I think some of my favorite scenes are the kind of showdown between them when Maeve locked them in the basement. Totally Kate: I think, you know… Mary held out for him for so long and then she finally gave up … I mean … I think everybody's glad, too that Mary and Jack got together while Kate was still playing Mary. Claire Labine: Yes. Oh yes. That was critical. Once we knew we really were going to lose her, and we didn't … we actually … we wanted her to stay – good God we wanted her to stay. But we didn't try to keep her because it didn’t seem fair to her. She really… we tried, I mean yes. But our resources were limited, two and a half years into the show, and it was … we did what we could, but we knew it wasn't going to be enough. Nor could… as her friend… friends… could we say, 'this is the best thing for your career.' Because she'd done it. She'd made a big impression in the part and it was time for her to go and see what else… you know, what else was up. And there are not a lot of actors to whom I would say that. I mean it's… a soap job is a wonderful job, especially if you want to be a theater actor and you're in New York. It pays the bills. And if you have a response – in those days I think the shows were better than they are now – you could be proud of them more easily than you always can now. And it … you know… it really was a good thing. But she really needed to go and see what she could do. Totally Kate: Now of course, I've always read that when Kate left you wanted to kill Mary. Claire Labine: We desperately wanted to. We wanted to send her out and the network wouldn't let us do it. Bad mistake. Claire Labine: Yeah. Oh yeah. We explained to them what we would do and how we would do it and what would happen as a result and, and actually, basically, years later we played what would happen as a result, which was, you know, Jack and Felicity LaFortune's character whom we loved and you know, we had that person in mind in … after a suitable period of mourning, after… after Jack, having an awful reaction to losing her…and a terrific negative reaction and almost going off the deep end and Maeve being the one who brings him back. And then… and then letting him get mixed up with Leigh. And that would have worked. It would have worked a lot better, I think, than … than what happened. But anyway, that's all right! Totally Kate: Yes. Well now, Kate came back. You came back and wrote when Kate came back and played some episodes where she kind of appeared to Maeve and Jack and they were wonderful. Totally Kate: There was one with Maeve. Claire Labine: Yeah, as many for Maeve, or at least two for Maeve … I remember writing two and just… we just winged them. And just from what we knew of the characters, and we knew it wasn't going to be on the air for at least a year, but the way that character was drawn and the way Jack and Maeve were drawn, you could write them honestly in almost any situation and make the build up to it very easily. It was … that show really was written out of character, and we never worried too much about long story because they'd tell us what was going on! Frequently we didn't know what was going on until we wrote it! You know. Claire Labine: Which was why we used to like to write the scripts, because that's when it comes alive. Now this is not the way it's done anymore. Totally Kate: So did you shoot those, then, a year ahead of time? Claire Labine: Yup. Ten months ahead of time, I think. Claire Labine: We had cast Leigh before we knew anything about what was going on. Totally Kate: Did you write the story line when Kate came back later when Ryan got married and she was Moira? Claire Labine: I wrote that script. I didn't write the story line, that was Tom (King) and … oh dear… Millee Taggart… head writers then. And I was working as an advisor. And I said, "If you're going to do this thing I'll write the Kate scenes and the Moira scenes." And they said, "You bet." And I had a wonderful time doing it. It was really fun. Claire Labine: Yes. Well I think she was intended to be. I think she was intended to be a mother… a mother's spirit. You know. And her likeness to Mary was … not coincidental. It was the mother whom Ryan wished she'd had. Claire Labine: And that whole fantasy and reality thing – I thought was really quite charming. It was not my idea. But I thought it was really quite lovely. Totally Kate: I really liked that too. Now you also did a movie called "Love Spell" with Kate and Richard Burton. Totally Kate: I just saw that on DVD like a year or so ago when it came out. Totally Kate: Now how did that all come about? Claire Labine: Oh God, that is such a long story! The … well… basically I knew I wanted to do a movie with Kate. I'd been working on the idea of a Tristan and Isolt set in Ireland – the story was Celtic to begin with. And just playing around with it, and then it seemed as though it, you know, might be possible. I ended up financing it myself. I learned that you never, ever, ever make a movie without having a distribution deal of some kind. (laughs) It was the days before the film festivals … and … not really, but you know there was Cannes, but that was… that was pretty much it. And it was a financial disaster but I've never had more fun in my life. It was really terrific. Totally Kate: I liked it. Claire Labine: Thank you! That's very sweet. Totally Kate: I was so glad that it came out on DVD because I finally got to see it. Claire Labine: I mean everybody worked for minimum. Totally Kate: I can't think he was cheap. Claire Labine: Well, there are parts of it, where if we'd had, you know, a hundred million dollar budget and all the time in the world, I couldn't have asked for more. Basically they were the scenes between Richard and Kate. Claire Labine: He was a love, and he loved her, he thought she was marvelous, and he was awfully generous to everyone in the cast and quite remarkably nice to me and I really, really thought he was terrific. He couldn't have been more wonderful to us. It was a really good and nice experience all the way around. Totally Kate: One thing I thought when Mary kind of… when Kate left the role of Mary, Mary kind of transferred to Siobhan – was that kind of intentional? Claire Labine: Yes. What we planned to do is bring Siobhan in after Mary died and make her the Ryan daughter. And I was so resentful…there were more great actresses who were playing Mary, but I was so resentful at not getting my own way that my heart just wasn't in Mary any more. Totally Kate: Right. That's what it seemed. Claire Labine: And I loved Sara (Felder) who played… who was the first Siobhan, and it was fun, you know, doing it again from a different point of view, and then … what was the name of the wonderful red-headed actress who was later? Totally Kate: Oh… Marg Helgenberger? Claire Labine: Yes. Correct. Marg… was, I mean really was a delight… she was, I thought she was wonderful in the part and … and contributed an enormous amount. And the character contributed an enormous amount to keeping it going as long as it did. Totally Kate: So what's keeping you busy now? Do you have some other projects going on? Claire Labine: Well, actually, I am… I've been working on a play for a couple of years, and I hope that the heroine dies before I do, but I suspect that may be the case! I may be able to finish it this spring! Totally Kate: I would love to see you and Kate do something together again. Claire Labine: Oh we would too. We really would too. We talk about it all the time. Totally Kate: That would be fun. Claire Labine: Did you see her Katharine Hepburn? Totally Kate: Yes. "Tea at Five". Claire Labine: Isn't that fabulous? Claire Labine: It's been in quite a few theaters in quite a few versions! Claire Labine: It … I thought was really a tour de force. I thought she did a wonderful job with it. Totally Kate: I did too. Well, I guess I should let you go, it's getting to 6:30! Claire Labine: If there is anything more you need, call back! Claire Labine: I just have to get dinner on the table, all right?! Totally Kate: I really enjoyed talking to you and if you get a chance check out my website – Kate's official website.